Collateral kin: Barnes & Ellis. | Scuffalong: Genealogy. Collateral kin: Barnes & Ellis. – Scuffalong: Genealogy. Collateral kin: Barnes & Ellis. My uncles migrated North. My father and his sister stayed put. (Since the late 1970s, they have lived across the street from one another and, during my childhood, within a couple of blocks.) 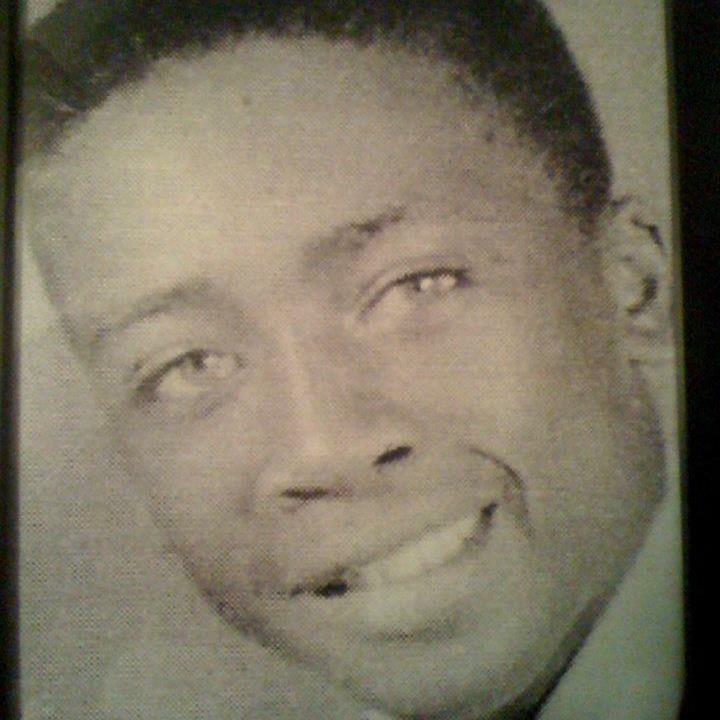 My father graduated high school in 1952, and in his class was the man my aunt would marry, Theodore Roosevelt Ellis Jr.
Theodore Roosevelt Ellis, Jr., 1950s. Uncle Roosevelt, who had startlingly hazel eyes and smooth, nut-brown skin, had deep Wilson County roots, and I have written of my bond with his family here. Today would have been his 80th birthday and, in his honor, I highlight his people. We called Uncle Roosevelt’s mother “Miss Edie Bell.” Miss Edie Bell’s earliest known paternal ancestor was Benjamin Barnes, born about 1819, probably in southern Edgecombe County or northern Wayne County (areas that later became Wilson County.) Circumstantial evidence, largely in the form of naming patterns and proximity, suggest that Benjamin had at least two brothers, Redmond Barnes, born about 1823, and Andrew Barnes, born perhaps 1815. On 21 April 1866, Benjamin Barnes and Violet Barnes, born about 1817, registered their long cohabitation at the Wilson County Courthouse. Their only certain child was Calvin Barnes, born about 1836, though they probably had several more. In the 1870 census of Saratoga, Wilson County, Violet is described as a midwife, and three young girls, Elvy (1859), Ailcy (1862) and Spicy (1863), live with them. Given Violet’s age, it seems likely that these are granddaughters. Violet Barnes died sometime before 13 November 1879, when Benjamin was married a second time to Mary Bynum in Wilson County. [The Benjamin Barnes, son of Isaac and Judia Bynum, who married Lucy Barnes in 1872 in Wilson County is a different man.] Benjamin and Mary’s appearance in the 1880 census of Saratoga is their first and last. Benjamin listed his father’s birthplace as Virginia, but provided no additional information. He died before 1900. Calvin Barnes and “Sealie” Barnes registered their five-year cohabitation in Wilson County on 17 July 1866. Celia’s parents are unknown. Nor do I know whether Calvin and Celia belonged to the same master prior to emancipation. In the 1870 census of Saratoga, Wilson County, Calvin and family are living next door to his parents Benjamin and Violet. Calvin and Celia’s children are Benjamin (1864), Spicy (1865), Jesse (1866), and Peter (1869). Also in the household are 20 year-old Dora Ebon (Calvin’s sister?) and her likely children Louisa (1866) and Mary E. (1869). In 1880, in Saratoga, Calvin heads a household that includes wife Celie and children Peter, Drue, Redman, Lizzie B., and William. In 1900, the family was listed in Stantonsburg township. Calvin was farming, and Celie reported 10 of 13 children living. Only four — William, Mary S., Laura and Celie, plus Mary’s daughter Dora — were at home. Son Peter was nearby with his wife Jane and children John R., General, Annie and Sallie, as was son Redmond with wife “Genett” and their first child Dora. Celia died prior to 1909, when Calvin married Cherry Brown Tart. The marriage was her third, and the 1910 census found them living in the town of Wilson on Stantonsburg Street. Ten years later, they are living at 610 Stantonsburg Street and both employed in a private home. Calvin died 21 February 1923 in Wilson. Calvin and Celia’s son Redmond Barnes was born 3 May 1873 near Saratoga or Stantonsburg. In 1898, Redmond married Jennette Best on W.H. Applewhite’s farm, where the Barneses were either sharecroppers or tenant farmers. (Applewhite’s grandson, James, is a celebrated poet whose writing often draws on the world of his childhood in Wilson County.) Edith Barnes Ellis’ siblings included Dora Barnes Weaver Ward (1899-1994), Fred Barnes (1901), Mary Estelle Barnes (1903-1989), Minnie B. Barnes Barnes (1905-1985), Edith Bell Barnes Ellis (1907-1984), Betty Lee Barnes Bullock (1909-1992), Nora Lee Barnes (1911), Alice Jennette Barnes Smith (1913), Lula Mae Barnes Speight (1916), Redmond Barnes Jr. (1918-1989), John Harvey Barnes (1920), and Jennette Barnes, who died in infancy. Redmond Barnes’ brother Peter Barnes (1869-??) married Jane Ruffin in 1891 in Wilson County. Their children included John Redmond (1892), General (1895), Annie (1897), Sallie (1899), and Albert (1900-1924). 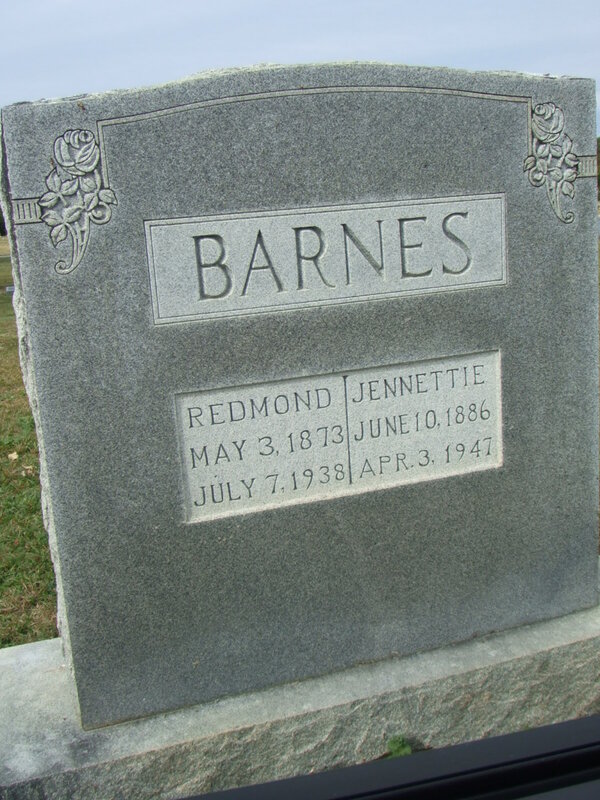 Redmond’s brother Andrew “Drew” Barnes (1871-1945) married Estella “Stella” Williams in 1892 in Wilson County. [Not to be confused with Andrew Barnes, son of Andrew and Amy Williford Barnes — probably Calvin Barnes’ first cousin — who married Stella Battle in 1870.] Their children included John (1890), Wade (1894), Frank (1895), James (1897), Lula (1898), and Andrew Jr. (1900). Redmond’s sister Elizabeth “Betty” Barnes (1873-??) married W.T. Sherrod Ellis, son of Reuben and Clarky Ellis. Their children: Willie (1892), Robert (1895), Mary E. (1896), Maggie D. (1899), Sallie (1900), Joseph (1904) and Mamie (1906). Redmond’s sister Mollie Barnes married Floyd Ellis. Their children included Floyd Theodore (1907-1981), Columbus (1909), John Adam (1916-1965), Mary Rebeckah (1919) and Leathie Charlotte (1922). Jennette Best was born about 1880 near Stantonsburg. Her marriage licenses lists her parents as Sam Best and Edy Strickland. However, in the 1870 census of Stantonsburg, Wilson County, “Edy Strickland” appears as Edith Winstead, age 10, in the household of Isaac Winstead, 52, and wife Jane, 35, whose other children were Robert, 7, Amanda, 3, and Aneliza, 1. Then, the 1880 census of Stantonsburg, shows “Ada Best” in a household with her stepfather Isaac Winstead, mother Jane, half-siblings Manda, Ann, Charlie, Major, Lucy and Levi, brother Rob Farmer, and likely children Sam, 3, and Mary Best, 1. Sam Best is not listed in the county and may have died or have deserted his family just before Jenette was born. I have not found him in any census or vital record. Nor have I found any other mention of Edith Best or Strickland. Rest Haven cemetery, Wilson, N.C.
On 7 June, 1933, Edith Barnes married Theodore R. “Tobe” Ellis. (We called her “Miss” Edie Bell, and him “Uncle” Tobe, which I can’t explain.) Theodore Ellis’ furthest known paternal ancestors were Isom Ellis and Patience Bynum. Isom (or Isham) Ellis was born about 1807 in southern Edgecombe County. The will of William Ellis, proved in Edgecombe in 1813, declared in part, “I leave unto my said wife Unity Ellis, the following negroes, To wit, Arthur, Jonas, Isom, Belford, Lisle, Pat, Minnah, and Tesary & Hester.” It seems probable that this listing is a reference to Uncle Tobe’s great-grandfather. On 24 July 1866, Isom Bynum and Patience Bynum registered their 40-year cohabitation in Wilson County. Several other men — Guilford, Robert, Jackson and Lewis — also registered as Bynums, but are listed with the surname Ellis in the 1870 census. For this and other reasons, including proximity and naming patterns, I believe these men were all sons, or close relatives, of Isom Ellis. Lewis Ellis, born circa 1834, first married Dossie Best, by whom he had one son, John (1853). He then married Millie Thompson (1832-??) 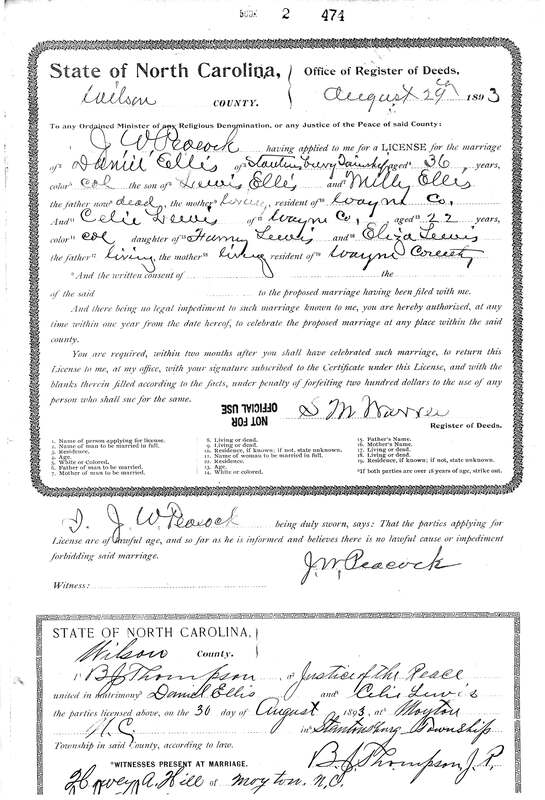 — they registered their cohabitation — who gave birth to Daniel (1860-1938), Mary (1863), Adeline “Addie” (1865), Martha (1868), Cora (1870) and James Ellis (1874). Neither Lewis nor Millie appears in the 1900 census. Lewis and Milly’s son Daniel Ellis first married Rosa Barnes, by whom he had a daughter, Lena (1890-1928). He then married Celia Lewis (1872-1912), daughter of Furney and Eliza Lewis on 29 August 1893 in Wilson County. Their children were William (1894), Maeliza (1897), Samson (1898-1918), Harry (1900-1988), Jackson (1901-1918), Robert (1904-1968), Louetta (1906), Orran (1910-1918) and Theodore Roosevelt Ellis (1912-1979). After Celia’s death in or just after childbirth, Daniel married Maggie Woodard in 1914. 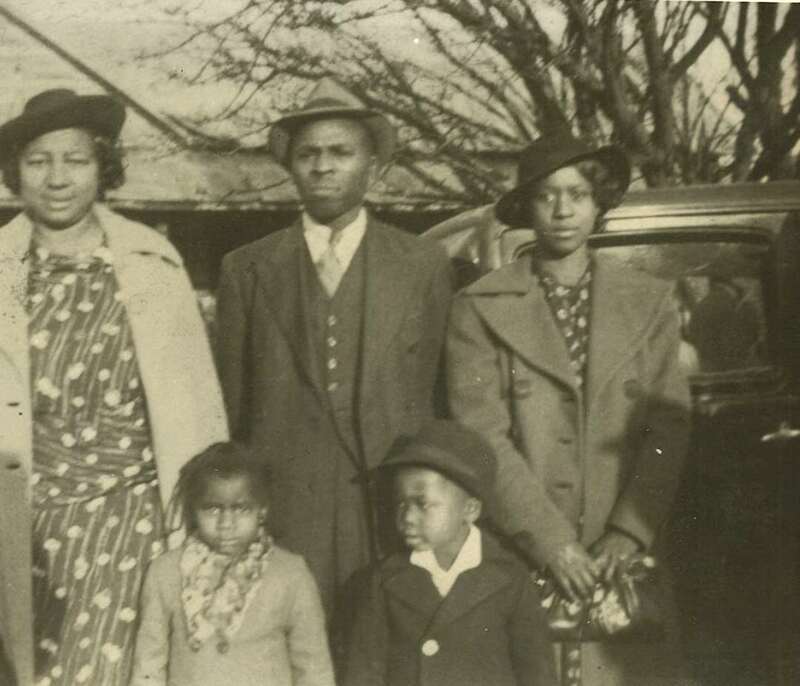 Their children were Mack (1916), John Henry (1919-1963), Mattie (1922) and Jem (1925). Daniel Ellis died 10 October 1938. Celia Lewis’ family was from Wayne County. In the 1870 census of Goldsborough, Wayne County, Furney Lewis, 40, and wife Eliza, 26, shared a house with Missouri, 11, Furney, 9, Lewis, 4, and Winnie, 5 months. Ten years later the family appears in Stoney Creek township, Wayne County: Furney Lewis, 58, wife Liza, 35, and children Lewis, 17, Winia, 9, Henry, 7, Cealy, 5, Mary, Caroline, 3, and Furney, 1, plus Furney Sr.’s sister Mary Lewis, 54. Eliza Lewis likely died before 1894, when 71 year-old Furney Lewis remarried. However, he is not found in the 1900 census. Top, Fannie Hardy Ward, Theodore R. Ellis and Edith Barnes Ellis. Bottom, Eloise Ward and T. Roosevelt Ellis Jr., probably near Stantonsburg, Wilson County, circa 1939. Thanks to Monica Ellis Barnes and Tracey Ellis Leon for use of family photographs. Photograph of headstone taken in March 2013. ← Daniel Artis, Union soldier? Beautiful, I am one of Thomas and Minnie Barnes’ great granddaughters. I remember your uncle, his wife and their two daughters from my youth. My grandmother is Jeannette Barnes Best granddaughter of Jeanette Best Barnes. Hi, Lisa! I’m so happy you found this piece. As you can see from this and other posts, the Barneses hold a special place in my memories. Hi Lisa…this is Howard. That Lisa (Armbrister) is my sister. Have a happy New Year! Hi, Howard! Happy New Year to you both! Hi, Carolyn! Thanks for commenting. Very interesting information. Actually, though, the Benjamin Barnes you speak of — the one who was the son of Isaac and Judia/Julia Bynum — is a different man. The parents of my uncle’s ancestor are as yet unknown. I found Furney Lewis in the 1900 census with Sarah (Walls)Lewis who he married in 1894 and his Son-in-law, Julius Williams, and Granddaughter, Laurena Newman.